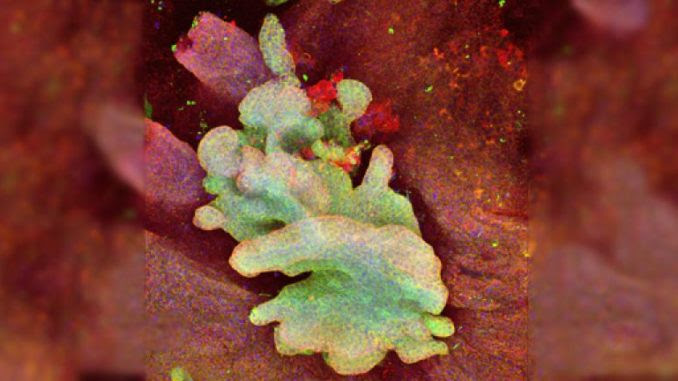 Scientists have discovered the ‘cell of origin’ which is thought to trigger all types of cancer and allow the disease to spread. Laboratory tests confirm the cell cheats death and breaks out of a zombie-like state to create deadly tumors in the body. Dailymail.co.uk reports: Salford University researchers have described their discovery as being like managing to find the proverbial ‘needle in a haystack’. But the findings, hoped to rewrite medical textbooks on the growth of cancer, could be a blow to existing treatments, such as chemotherapy. He added: ‘Scientists talk about cancer being caused by dying cells coming back to life, so-called ‘zombie-cells’. We now see it is more dramatic than that. In fact, it could be more accurately described as a prison break. He warned some chemotherapy can encourage stem cells to proliferate more, which may aid the growth of tumours. Two samples of human breast tumours were examined for the study, published in the journal Frontiers in Oncology. The scientists used fluorescent markers to isolate the most energetic cells taken from the samples in the laboratory. A tiny proportion of the cells – now branded energetic cancer stem cells (eCSC) – had much more energy than the others. They also had more ‘stemness’ – capability of creating a tumour – and high levels of proliferation – rapid increase in numbers. It is currently unclear how the rogue cells are able to break out of senescence – a process linked to ageing that causes cells near the end of their lives to ‘freeze’ and stop multiplying – and further tests are needed to prove any theory. But the researchers believe the eCSCs may use antioxidants and the mitochondria – the cell powerhouse – to launch an attack. Professor Lisanti said: ‘It feels like finding the proverbial needle in a haystack, and it crucially gives us a new window on cancer and how we might stop it. ‘Most cancer patients die because of the spread of tumour cells to distant sites, known as metastasis. ‘The evidence is increasingly that metastatic cancer stem cells, fuelled by mitochondria, are responsible. Metastatic cancer, known as stage four, is often not curable. Most treatments exist just to extend a patient’s life. Almost 360,000 people in the UK and 1.7million in the US are diagnosed with cancer every year.